When you are invited to a Russian person’s home you’ll likely enter the dining area to see a table laden with small plates of food. This type of spread is known as zakuski, which translates to “something to bite after.” Zakuski are essentially snacks that are meant to be eaten while drinking shots of vodka or other alcohol. Popular zakuski include smoked fish, cured meats, salads generously dressed with mayonnaise, blini and caviar, marinated mushrooms, and at least one kind of pickle. Pickled cucumber or cornichons are common, but so are all kinds of other pickled vegetables and fruits. Russians and Slavic people love pickles. Like many great culinary traditions, the practice of pickling and preserving was born out of necessity. The growing season for fresh fruit and vegetables is relatively short and it became essential to preserve the bounty of fresh produce for the dark cold days of winter. Historically, much of the food preservation used salt to pickle and/or ferment as opposed to using vinegar-based brines; this results in a saltier but less sour pickle. Pickled and fermented produce are also valued for their health benefits. Fermented foods can aid digestion and help with good gut bacteria. This is particularly welcome when you’re eating rich and hearty foods. Most importantly, pickles are flavorful. Pickled foods were particularly popular in Jewish communities in Russia and Eastern European, and often because they added bright acidity and strong flavors to complement staple bland foods like bread and potatoes. In fact, Eastern European Jews introduced dill pickles to America during the late 1800’s and early 1900’s when they began arriving in New York. The practicality of preserving summer food for the winter is clear, but these pickled fruits are equally refreshing on a hot summer day, preferably eaten with a meal outdoors. I’ve picked three of my favorite zakuski recipes to share: pickled sour cherries, watermelon, and peppers. The sour cherries only show up for a short time every year, and I try to get a big bag whenever I see them available. They are great for pie or for compote, but I love them pickled with a little cardamom. They end up tasting like an elevated maraschino cherry - tart, not too sweet, and complex. They’re great in a cocktail, and just as good as a side to BBQ. Pickled watermelon is a classic in Russia, Ukraine, Georgia and other Soviet countries. Russians typically add garlic, bay, and dill to the brine, which makes the watermelon a savory treat. I love to serve it alongside cured meat or grilled sausages, and it also goes well as a pre-meal bite to eat alongside salty snacks served with ice cold vodka (or beer). The pickled peppers are easily my favorite. My grandmother called them “marinated peppers” and they were a staple dish in her home. She served these peppers at the first course of every dinner, and they always managed to stay on the table throughout the meal. I especially loved to have them along with chicken schnitzel and potatoes. The techniques described in these recipes can be used on just about any kind of produce. The process for the watermelon quick pickle is simple and would work well for tomatoes, cauliflower, green beans, and more. First you make a brine with a combination of salt, sugar, and any aromatics you’d like. You pour the brine over the fruit or vegetables, and then refrigerate. The pickles are ready the next day, but the longer they sit in the fridge, the deeper the flavors are developed. The tangy vinegar based marinade for the peppers would be excellent with mushrooms. And the sweeter brine for the sour cherries would be great with plums or peaches. These pickles last for months stored in the fridge… if you can go that long without eating all of them or sharing them with friends. There’s nothing quite like arriving at a table with many colorful dishes already laid out waiting for you to dig in. It’s an invitation to enjoy, relax, and eat. Wash the watermelon very well, and then slice into desired pieces. I like mine about ¾-1” thick, and cut into small triangles with the rind still on. In a large glass jar or ceramic crock big enough to hold the watermelon slices, place the dill, garlic, a few of the bay leaves, and the Serrano chili in the bottom. Layer the cut watermelon on top. If necessary, divide these ingredients among jars, and place the aromatics on the bottom of each jar. In a medium pot, combine the water, salt, sugar, vinegar and peppercorns. Bring up to a simmer, and heat until the salt and sugar is just dissolved. Pour the liquid over the watermelon in the jar(s). Top with the remaining bay leaves and a little more dill if desired. If the watermelon is floating above the liquid, you can weigh the fruit down by placing a small plate inside the jar with something heavy on top. Allow the mixture to fully cool, and then refrigerate. The watermelon is ready to serve after 24 hours, but it is best if you wait 3-4 days before serving. Place pitted cherries in clean jars. Combine the vinegar, sugar, water, salt and cardamom in a small pot. Bring to a simmer and heat until the sugar is just fully dissolved. Pour the brine over the cherries. Allow the mixture to fully cool, then securely cover the jars and refrigerate. They are ready to serve after 24 hours in the fridge, but they will develop deeper flavor the longer they sit. Lay your peppers out on a lined sheet tray or baking dish. Place the peppers in the oven for 30-40 minutes, or until blackened, softened, and until the skin gets wrinkly and starts to peel off. It helps to flip the peppers over halfway through the cooking process. You can also do this directly over a gas flame or on a grill, turning the peppers until they are blackened and cooked on all sides. Once cooked, transfer the peppers to a heatproof bowl and cover with plastic wrap. Allow the peppers to continue to steam and cool for 20-30 minutes. At this point, the peppers should peel easily. Over a bowl, peel the peppers, and remove the stems and seeds. If any juice escapes while you are peeling the peppers, save the juice. It is gold. Slice the peeled peppers into strips, about an inch thick, or however you prefer. Add the peppers to the bowl of their reserved juices. Add the sliced garlic if using, peppercorns, salt and sugar to the peppers. (If you do not like strong garlic flavor, omit the garlic entirely.) Mix everything together gently. Cover the peppers with white vinegar and water. Add the olive oil. Let the peppers marinate in the fridge overnight before serving. Peppers last in the fridge for about a week. What do I want in a wing? Something that is crispy with a sauce that packs tons of flavor. Pomegranate molasses is a perfect base for wing sauce. Pomegranate molasses isn’t a molasses at all, it’s actually just pomegranate juice that is reduced until it is thick and syrupy. You can even make it yourself at home, but it is easy to come by at any Middle Eastern or Persian market, as well as online. I’ve even spotted it at Whole Foods. Pomegranate molasses is tangy, a little sweet, and with the dark and shiny sheen of real molasses. It’s a common ingredient in Middleeastern cooking, where it’s added to all kinds of dishes from stews, to dips, to glazes for meats, and more. If you’ve ever read an Yotam Ottolenghi cookbook, than you know it’s also one of his favorite ingredients to add to vegetable dishes. Years ago, I first got inspired to add pomegranate molasses to wings when I saw Aarti Sequeira make a version of this dish on Aarti Party, her Indian-themed cooking show. Since then I’ve reworked the dish to skew it towards my own preferences, and in a slightly more Middle Eastern direction. 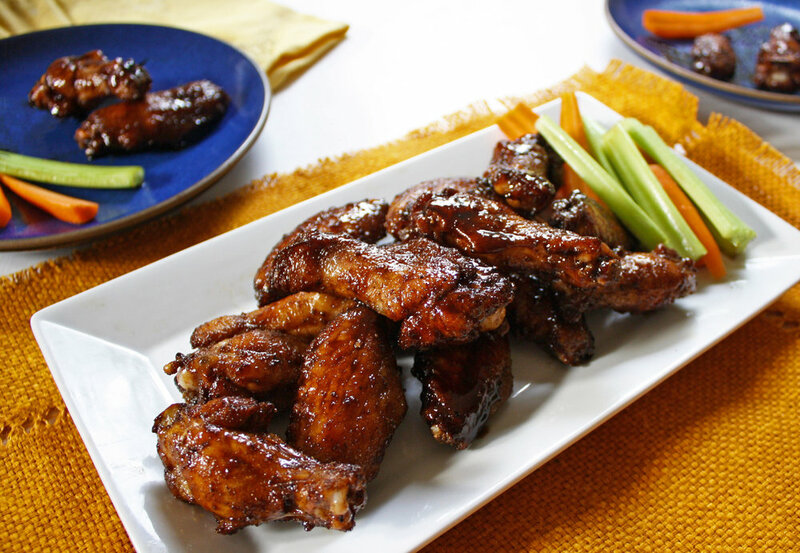 These wings get generously marinated in a spice mixture of coriander, cumin, cardamom, allspice, and pepper. The pomegranate molasses sauce gets Sriracha added to it for heat, which is a decidedly un-Middle Eastern ingredient, but a perfect compliment to the dish with its peppery garlicky spiciness. To make cooking for a crowd a little easier, the wings are baked not fried; they still crisp up nicely, but you don’t have to deal with the mess, work, or the extra calories that comes with deep frying. Spiced pomegranate molasses wings have become a staple party food recipe in our house, Superbowl Sunday or otherwise. 1. Pat the chicken wings dry and place them in a large bowl. 2. In a small bowl, combine the salt and spices. Add the spices to the chicken, and toss the wings until they are all well coated. Cover and refrigerate the wings for 1 hour to allow the chicken to marinade in the spice mixture. 3. Preheat the oven to 400°F. Place a rack on a baking sheet and spray or brush the rack with oil. If you don’t have a rack to cook the wings on, you can place them directly on a baking sheet, they will just get slightly less crisped. Add the marinated wings to the baking sheet, leaving ½” of room between each wing. 4. Bake for 30-40 minutes, or until cooked through with an internal temperature of at least 165°F. Flip the wings once after 15 minutes of cooking time. 5. While the wings are in the oven, prepare the pomegranate molasses sauce. Add the pomegranate molasses, maple syrup, Sriracha, and a tablespoon of oil to a small pot. Heat on medium low, and allow the sauce to simmer for 10 minutes, or until the sauce has slightly thickened. Taste and add salt & pepper as needed, or more Sriracha/maple syrup depending on your preference and the tanginess of the pomegranate molasses. 6. Once simmered and slightly reduced, remove from the heat and add the vegan butter; this will add a smooth richness to the sauce. 7. Once the chicken is cooked, transfer it to a large heatproof bowl, pour the warm sauce all over the chicken, and toss until everything is well coated. Serve hot with your favorite sides or dippings sauces. ...This salad was first prepared by Lucien Olivier in the 1860’s. Olivier was the French chef of a famous restaurant in Moscow called The Hermitage, hence the very French name for this now popular Russian salad. Also, Russians were obsessed with French culture at that time. Salad Olivier was an immediate hit, and it became the restaurant’s signature dish. Originally, it was made with crayfish, capers, and even grouse. After the revolution, simpler and easier to come by ingredients were more commonly adapted into the recipe. These ingredients are also all conveniently available in the dead of winter. The popularity of the salad spread beyond Russia to Eastern Europe, the Balkans, and even to Iran and Pakistan. In fact, in our family we call this dish Salad de Boeuf (pronounced as “de beff”), which is what this salad is inexplicably called in Romania and Western Ukraine. Boeuf means “beef” in French, and this salad contains no beef at all. In each geographic locale, the salad might differ slightly. Sometimes the potatoes are mashed instead of cubed, or there’s shredded chicken instead of smoked meat, or sometimes there’s no meat at all, as was the custom in our family. What makes this type of potato salad uniquely a Salad Olivier is the presence of potatoes combined with carrots, peas, pickles, and hard boiled eggs. Everything should be chopped to roughly the same size. The appeal of something seemingly odd and vaguely average is ultimately mysterious, but the combination of hearty firm potatoes, sweet cooked carrots, crisp pickles, earthy peas, and silky eggs in a creamy tangy dressing just works. The ingredients meld all together, each losing its own particular edge to combine to make a complete range of salty, sweet, tangy, satisfying tastes in each bite. I think this salad’s enduring and far-reaching popularity proves that it’s eaten for more than tradition’s sake. If you’re going to attempt to make this for the first time there are a few things to know. For one, this recipe reflects how my family likes this dish. If you’ve had this before it might be slightly different from what you’re used to. More importantly, the quality of each ingredient matters to the overall success of the dish. I like to use Yukon Gold potatoes because they hold up well and have a pleasant rich sweetness, but you can definitely try it with your favorite potato. Taste the carrots before you cook them; they should be sweet and flavorful, not the dull astringent variety you sometimes end up with. The best pickles for this dish are ones that come from the refrigerator section, that still have a crunch, and are brined in salt with zero vinegar added. They’re also known as “naturally fermented” pickles. The type of mayonnaise you use is also key, and I swear by Hellmann's/Best Foods brand mayo. Wash the potatoes and carrots well. Add them to a pot, and fill with water. Bring the water to a boil, and boil the potatoes and carrots until easily pierced through with a knife. The carrots will cook faster, about 15-20 minutes. Once they’re tender remove them from the pot and allow the potatoes to finish cooking, about 15-20 minutes more, or 30-35 minutes in total. Be careful not to overcook your potatoes and carrots, you do not want them to end up as mush in the salad. Once cooked, set aside to cool or refrigerate. This step can be up to 2 days in advance. While the potatoes and carrots are cooking, hard boil your eggs and allow them to cool. Once cooled, carefully remove the peels from your potatoes. You can either remove or keep the peel on your carrots depending on your preference. Cube all of the potatoes, carrots, and eggs to the same size. I like a medium-small dice. Dice the pickles slightly smaller than the other ingredients as they have a stronger flavor. Add the cubed potatoes, carrots and eggs to a large bowl. Add the pickles and thawed peas to the bowl. In a separate small bowl, combine all of the ingredients for the dressing and whisk together. Taste and adjust accordingly. Add the dressing to the potato mixture, and carefully stir until everything is fully coated in the dressing. Taste and add more salt if desired (every brand of kosher salt differs in salinity). If you want it creamier/tangier, add more mayonnaise or lemon juice. You can also use sour cream or yogurt if desired. Allow the salad to chill for at least one hour before serving so that the flavors can all come together. This salad can be made up to a day in advance, and stores well for 2 days. You can also make this without the dressing up to 3 days in advance, then add the dressing before serving. Before serving, transfer the salad to a serving bowl. This salad is known for being creatively decorated and festively garnished with fresh herbs, vegetable roses, etc. You can doll it up in any way you like. This is a seasonal twist on classic burekas that I wrote up for alma. (check out their site for the full article). The caramelized onions are the key ingredient in this dish; they always take longer than you think to caramelize, but the resulting flavor is worth the work. This makes a great side, appetizer, or snack during the holidays. Drizzle the halved butternut squash with oil, then place it cut-side down on a sheet pan. You don’t need to peel the squash. Roast until the squash is fully cooked and tender, about 35-45 minutes. While the squash is baking, caramelize your onion by putting a few tablespoons of butter with a drizzle of olive oil in a sauté pan over medium low heat. If keeping the dish non-dairy, use just olive oil. 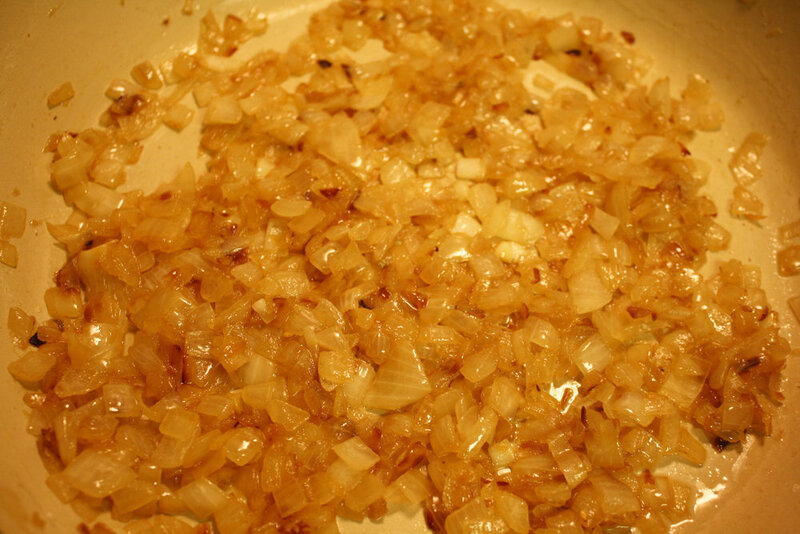 Add the diced onion to the pan, and sauté over low or medium low heat until starting to soften, about 5 minutes. Season with a generous pinch of salt and then continue to let the onion cook and caramelize, stirring occasionally so the onion doesn’t burn; make sure to keep the heat fairly low. This is where patience comes in, beautiful caramelized onions can take 30-45 minutes to make. You want your onions golden and sweet, you don’t need to caramelize them until they’re a deep brown. This is a good tutorial if you need it. Add the minced garlic to the caramelized onions, and sauté for another 2-3 minutes or until the garlic is fragrant but not at all browned. Turn off the heat. Once the squash is cooked and slightly cooled, scoop the inside of the squash into a bowl and discard the peel. Add the caramelized onion to the squash. Mix together. The mixture should be soft and not too lumpy. Mix in the ground coriander, thyme, and cayenne. Taste, and then season with salt and pepper as desired. 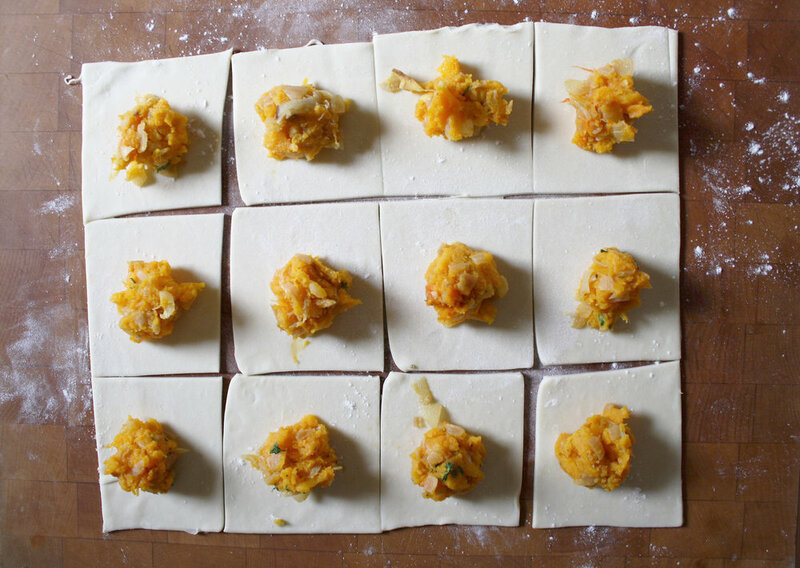 Allow the squash mixture to cool before assembling the burekas. You can make this filling up to two days in advance and store in the fridge. To assemble the burekas: roll out a sheet of puff pastry until rectangular and just slightly thinner than when it comes out of the package. Divide the dough into 12 squares: cut the dough in half widthwise, and then cut each half into half again. Next, cut the dough into thirds lengthwise. Put a spoonful of the filling into each square. Fold over the dough to form a triangle shape, and press the edges together. There’s no need to crimp or press too hard, the filling will stay put, and you want to ensure there are layers of flaky pastry. Transfer the formed triangular burekas onto a baking sheet, place each bureka about an inch apart, 12 will fit on each baking sheet. At this point, you can freeze the burekas and reserve them for when you’re ready to bake. Before baking, combine the large egg yolk with a small splash of water. Beat well. Brush the tops of the burekas with the egg wash. Sprinkle with sesame seeds. Bake for 20-25 minutes, or until golden brown and flaky. Transfer to a wire baking rack, and allow to cool for at least 10 minutes before serving. Burekas are best served warm or at room temperature. My article with recipes for Tu B'av (the Jewish Day of Love) is up on .alma right now! Below is the dish that I can't stop eating right now. It's more of a recommendation than a recipe - which is my favorite kind of dish to make. And is there anything better than tomatoes in August? They help me get through the dog days of summer here in Los Angeles. You need so little to make them good. And in my humble opinion, beautiful sweet tomatoes, heavily salted, on crisp good bread with excellent butter is incredibly romantic. Enjoy! Slice the tomatoes into rounds, just under ½” thick. Lightly salt the tomato slices. The salt will start to soften the tomatoes and season them all the way through. Place the bread slices on a baking sheet. Drizzle lightly with olive oil. Bake the bread for 6-8 minutes, or until just toasted and beginning to brown on the edges. Once the bread is toasted, spread butter onto each piece. This dish is all about layering of fats and salt with the tomatoes. Top the toasts with the tomato slices. Top the tomato slices with thyme leaves. Drizzle with a little more olive oil (for a little more oomph). Sprinkle Maldon salt over everything – this will add a nice salty crunch. You can bake the toasts ahead of time and assemble them with tomatoes when you’re ready to serve, the bread doesn’t have to be hot, and the tomatoes will mellow out the bread’s crunch. Citrus season in California always seems never ending to me. In a good way. But there is a season, and that season peaks in winter, and spills into spring. The Meyer lemons are still around, but they're definitely on their way out. Before they go, I like to preserve a few jars. Preserved lemons are some of the easiest of preserved foods to make. They involve little other than lemons, salt, and sanitized mason jars (just boil the jars totally submerged in water, lids off, for 10-12 minutes). You can flavor them with whatever spices you like - although I'm partial to the combination of black pepper, bay, and cinnamon. A friend gifted me a jar of lemons she preserved with fennel seed and pink pepper corn, which was lovely. They're pungent, and borderline astringent. They're salty, acidic, and flavor-packed. A little goes a long way. But that little bitt adds notes of complexity. It makes you go: "what's in this?" It both highlights the essence of a lemon, and takes lemons to another otherworldly flavor. I like to use them in homemade hummus (a la Joan Nathan's recipe in her new cookbook). They're beautiful in chicken dishes, and in tagine (they are a common North African ingredient). I also like to make a simple dip with thick plain yogurt, chopped fresh mint, and super finely chopped preserved lemon. This recipe works for any lemon, but lemons that are thin-skinned, like Meyer's, seem to work best. Quarter each lemon by slicing the top down within half an inch of the bottom, leaving them connected. Pack salt into the lemon then press it back into its original shape. Fill the bottom of the mason jar with a layer of salt. Layer the salted lemons into the bottom of the jar. Top each layer with more salt, and squeeze lemon juice over each layer as well. Top each layer with bay leaf and peppercorn, and stick the cinnamon stick into the jar as you layer. Pack all of the lemons in tight and make sure everything is covered with a layer of salt and lemon juice. Place the jar on your kitchen counter or in a pantry and shake the jar once a day for 30 days. After 30 days, the lemons are ready for use. Once opened, I prefer to keep my lemons in the fridge. They’ll keep for up to 1 year. Before using the lemons, rinse each piece as needed to remove the excess salt. Why do matzo balls need to be confined to soup? In the spirit of freedom, these matzo balls are let go from their usual broth home, and instead,they're dunked into hot oil, fried until golden, and served with a spicy herbaceous schug dip. These matzo balls are more hush puppy than airy donut. You have to expect denseness with matzo meal. Once you get over the absence of soup, and the slightly unexpected texture, you find yourself halfway through a second matzo ball... they are delicious and addictive. Schug is a spicy cilantro and chili sauce, that is commonly found throughout the Middle East. I love the recipe from Zahav, by Michael Solomonov (brought to my attention by friend and collaborator Ellie Bowman), but there are many other recipes out there. You can often even pick up this stuff pre-made at your favorite Israeli restaurant or Middle Eastern market. And we've been putting these recipes into motion over at the Assembly Line. Combine the matzo meal, salt, baking powder, and baking soda together in a large bowl. To the matzo meal mixture add 4 beaten eggs, ¼ cup of oil, and spices. Stir until just combined. Chill the dough for at least 1 hour. Once chilled, formed the dough into even-sized balls. Fill a Dutch oven or heavy bottomed pot with 3 inches of oil. Heat until hot, about 350°-375°F when tested with a candy thermometer. Drop the matzo balls into the oil in batches. Be careful not to crowd the pot, add 6-8 matzo balls at a time. Fry until golden brown on all sides. Once cooked transfer to a sheet pan lined with paper towels and fry the next batch. You can can keep them warm in a warm oven if necessary. The fried matzo balls are best served hot and fresh. In a bowl, combine the yogurt and schug. Mix until incorporated. In a food processor, combine all of the ingredients except the oil. Once processed into a coarse paste, transfer to a bowl. Whisk in the oil. The sauce will appear chunky, not smooth. Store in a container in the fridge for up to 1 month. Hamantaschen. Triangular. Filled with stuff. Made for Purim. Meant to resemble Book of Esther’s Haman. Also maybe meant to resemble aforementioned defeated enemy’s ears (in Israel Hamantaschen are called “Oznei Haman” - translation from Hebrew: Haman’s ears). Whatever they are, they are defined by their shape. There are endless variations on their dough, their size, their flavors, and their fillings. This year, like many other years, I continue to explore the possibilities of what Hamantaschen can be. I experiment with the dough. Egg or no egg? Butter or margarine? Sweet or savory? Traditional fillings or crazy fillings? I'm still seeking my perfect version of a sweet, not-too floury dough (this one comes close), but I am increasingly happy to eat a pastry that is a little more savory. 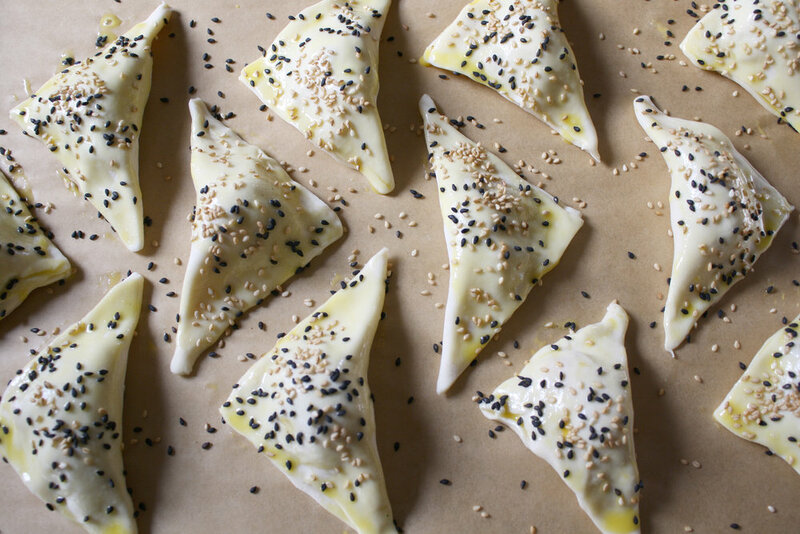 While it has a note of sweetness, this hamantaschen is more appetizer than dessert. The dough is the same used in flaky pie dough or crostatas, the filing has leeks, fig preserves and Cambazola cheese. The result is salty, sweet, and rich. As a cautionary note, the impulse may be to fill these generously with your filling; exert restraint, it will seem like too little but any more will cause the cookie to overflow or taste too filling-heavy. Another cautionary note, make sure to really pinch shut the edges of each hamantaschen. These tricky guys like to unravel in the oven any chance they get. In a food processor, add the flour, sugar and salt. Pulse a few times. Add the cold cubed butter. Pulse until the mixture forms pea-sized crumbs of butter and flour. (If doing by hand, using a pastry cutter combine the dry ingredients with the butter until pea-sized balls form). To the food processor add the apple cider vinegar, and the ice water a few tablespoons at a time. Pulse until the mixture comes together in a ball. If the dough doesn’t stick together easily between your fingers, add another tablespoon of water. When it is done, the dough will be slightly crumbly but will easily form into a ball. Form the finished dough into a flattened disc, wrap in plastic and refrigerated for 2-3 hours or overnight. Flour your surface and rolling pin lightly. Roll out the dough until about ¼-inch thick. Using a 3-inch biscuit, cookie cutter, or even a drinking glass, cut out rounds from the dough. Fill each round with ½ a teaspoon of the leek mixture, ½ a teaspoon of fig preserves, and ½ a teaspoon of cambozola blue cheese. Fold over one third of the round onto the filling, fold over a second third, and fold over the last third. With each third, gently pinch and seal the edges of the dough firmly together, forming a well-secured triangle-shaped pastry. Transfer the hamantaschen onto the parchment-lined baking sheet. Make sure there is at least an inch between each pastry. You can re-roll the remaining dough and form more hamantaschen. In a small dish, beat an egg. With a pastry brush, brush the top of the dough with the egg wash. Top with freshly ground black pepper if desired. Bake the hamantaschen for 12-14 minutes, or until golden brown. Once baked, transfer to a rack to fully cool. Serve at room temperature. The hamantaschen can be stored in an air-tight container for several days, if they last that long. My love of Japanese food led me to reconsider the traditional Hanukkah potato latke served with applesauce and sour cream. Don’t get me wrong, classic latkes are delicious, but sometimes I love a little variety on my holiday table. Traditional Japanese tempura is often served with citrusy Ponzu sauce and finely grated Daikon radish. The salty tangy Ponzu, accompanied with the fresh cool Daikon are as welcome to latkes as they are to lightly fried vegetables and fish. Adding Daikon to the batter as well makes these latkes a touch sweeter and lighter than their all-potato counterparts. Flavorful sharp scallion garnish the latkes and bring a touch of brightness to the final dish. The recipe can be halved, but you may want to even double it. These latkes will go fast! Start by making the Ponzu sauce. Add the soy sauce into a medium sized bowl. Juice the lemon and orange through a strainer over the bowl of soy sauce. Add the mirin and pepper flake, whisk until combined. Set aside and reserve. Ponzu sauce can be made ahead and will keep up to 1 week in the fridge. Preheat the oven to 325°F/165°C. Peel and grate the potatoes, Daikon, and onion into a large bowl. Using a clean dish towel, squeeze the moisture out of the combined potatoes, Daikon and onion. This step ensures a crispy latke! To a large bowl, add the potatoes, Daikon and onion. Add the sliced scallion, beaten eggs, flour and salt to the bowl. Mix until just combined. Line a sheet pan with paper towels. Add about ⅛-¼ inch of oil to a large heavy-bottomed skillet, cast iron is ideal. Over medium high heat, allow the oil to get hot. Test the oil with a small piece of potato. If it immediately starts to sizzle and bubble the oil is ready. Form the latkes into small thin patties. I make mine to fit the palm of my hand, but these can be as wide or small as you prefer. Carefully add the latkes to the hot oil. Brown on one side for 2-3 minutes, flip and brown for another 2-3 minutes. Occasionally, rotate the pan or adjust the heat to ensure even browning and cooking. Like pancakes, the first batch is usually the worst, so don’t get discouraged. When browned and crispy on each side transfer the cooked latkes to the lined sheet pan and allow to rest. Fry the latkes in batches, be careful not to crowd the pan. Add more oil as necessary to maintain a constant level. Adding more oil will drop the temperature, so adjust the heat as necessary. Keep the latkes warm in the oven until ready to serve (remove paper towels from sheet pan). Serve warm and fresh! Using a microplane or the small size on a box grater, grate the Daikon radish. Thinly slice the scallion. Top each latke with the grated Daikon radish and sliced scallion. Serve alongside the Ponzu dipping sauce. I never tire of making crostata's and galettes (as is obvious on this blog). I love that they can be sweet or savory, or walk the line between sweet or savory. I also love that the pastry is simple, with very little wait time. And most importantly, it's a great way to use up some extra ripe fruit. This pear and goat cheese crostata walks the line between sweet and savory. It's great as an afternoon snack with a cup of tea or coffee (or glass of wine! ), or sliced into small wedges as an appetizer at a dinner party. It could also be a dessert, if you're into serving something not too sweet. Also, add more sugar, it will be sweeter. Take away the goat cheese, it will be less savory. The rosemary adds such a nice hit of green and aromatic flavor with or without cheese. If you don't have rosemary, try something else: thyme, black pepper, tarragon, or maybe even marjoram. If you don't have a food processor, you can even make the crostata dough by hand (and it's arguably better that way). A food processor helps if you're nervous about mixing it all up evenly and well. Also, good butter helps. This is a good place to splurge on a nicer brand as there really aren't too many ingredients in this pastry. For flour, I prefer King Arthur brand, for its high protein content, but any kind will do. And if you don't want dairy, you could use a quality vegan margarine (like Earth Balance) in the dough; it will make the pastry a little saltier (so omit any additional salt), and it's not quite as great as butter, but it 100% works. And lastly, the pears. You want good pears. I like them in this dish when they're really ripe. Even a little bruised is ok. If they're too hard the tart doesn't bake as evenly. You use Bosc, Anjou, or whatever you can get your hands on that's good at the market. You don't need to peel them, and they add such a nice pop of color. To a food processor, add the flour sugar and salt. Pulse a few times to combine the mixture. Add the cubed butter to the dry ingredients, pulse until pea-sized pieces of dough are formed. Alternatively, you can use your hands or a pastry cutter to combine the dry ingredients with the butter. To the dough, add the apple cider vinegar and 1 tablespoon of water at a time. Pulse until the dough comes together into a ball but is not too wet. It should stick together between your fingers when squeezed. Roll the dough into a ball, wrap tightly in plastic wrap, and refrigerate for at least one hour. While your dough is chilling, prepare the fruit and cheese. To a bowl, add the sliced pear, sugar, honey, rosemary, and lemon juice. Roll the dough out onto a lightly floured sheet of parchment paper. The dough should roll out to about 12-13 inches in diameter, or about ½ an inch thick. The edges do not have to be perfect. Leaving a 1.5-2 inch border, pile the sliced pears into the middle of the crust. Dollop the goat cheese over the top of the pears. Fold the edges of dough over the pears. Brush the top of the dough with the beaten egg yolk. Sprinkle the Turbinado or raw sugar over the brushed dough. Transfer the crostata with the parchment paper onto a baking sheet. Bake the crostata for 45-50 minutes, or until the crust is golden brown and the pears are tender. If the crust starts to brown too much before the pears are cooked, cover the the exposed crust with foil. Drizzle a little honey over the hot crostata. Slice and serve warm or room temp. People often thinking of pickling as a daunting task. It can involve sterilizing mason jars, extended wait times, and washing and cutting huge batches of vegetables or fruits. I love pickled things, and I love the craft of food preservation. But one of the things I love most about pickles is their flavor: briny acidic notes that wake up your taste buds with tang and oomph. A quick pickling process can achieve great flavor when you don't as much time or patience. I'll never say no to a classic dill pickle, but I've also fallen in love with pickled fruits. Fruits are perfect for pickling; their sweetness allows for that sweet/sour combination of flavor that is so complex and satisfying. From watermelon to peaches, strawberries to plums, there are so many options. It all depends on the season and what's available. In fall, I love to quick pickle grapes. I'll serve them as an accompaniment to a cheese platter, or thinly sliced in a salad (with hearty greens, toasted almonds, ricotta salata, and a good vinaigrette). They're sweet and acidic, aromatic and crisp. A few notes: You definitely taste the garlic in these grapes. If that's not a flavor you're into, skip the clove of garlic. If you can't get your hands on pink peppercorn, you can skip that ingredient or just add more black peppercorn. In fact, you can skip a lot of the spices. They key elements are vinegar, salt, and sugar - the rest is up to you. I use this brine for lots of pickles. Aside from grapes, I also love it for shallots or red onion. A pickled onion is a great addition to sandwiches, salads, or as a topping for grilled meats. Trim the tops off of the grapes. This will allow the pickling brine to fully penetrate and flavor the grape. Place the grapes in a heatproof mason jar or bowl. In a small pot, bring the vinegar, water, orange juice and zest, salt, sugar, peppercorn, cloves, bay leaf, and cinnamon stick to a boil. Simmer for 2-3 minutes until the salt and sugar has fully dissolved, and all of the flavors have melded together. Pour the brine mixture over the grapes. Transfer the grapes to a jar or air tight container. Let the grapes marinade for at least 1 hour, or preferably overnight in the fridge. Grapes will keep for up to one week in the fridge.